If you’ve ever wondered, but never really knew, now’s the time to discover something new! Wonderology is the kid friendly science line that makes learning a blast! Explore the mysteries of science like never before with this over-the-top fun science line! Now you can make ooey-gooey slime with the ultimate slime creation kit! Create colored, magnetic, glow-in-the-dark slime and more! Kids will learn all about Polymers and how slime really works! 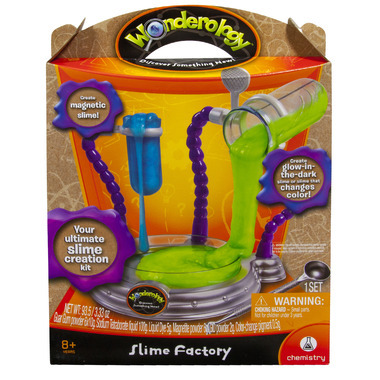 Explore the wonderful world of science with Wonderology and the Slime Factory Kit! Creates coloured, magnetic and glow-in-the-dark slime!